Doesn’t all of this medical talk sound like total gibberish to you? TV series like House and ER make you feel like it takes a PhD in medicine to figure out what the hell the actors are talking about. Now there is an app to help you teach yourself some important medical terminology. Find out in our test whether Speed Anatomy can help you impress your biology teacher, understand your doctor’s prescriptions or simply turn you into a doctor wannabe. 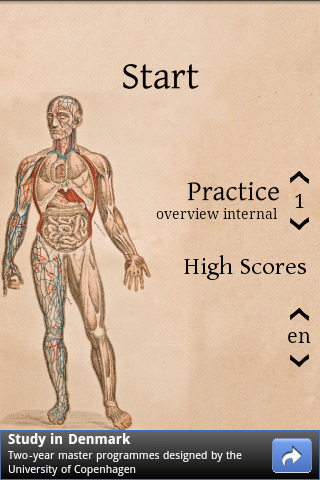 Speed Anatomy is a game that helps you learn in detail all of the human body part. At first the medical term for a human body part is displayed. At the same time you have a timer on the left side of the screen. Quick and accurate responses get you more points. Guessed the wrong organ? No points for you then, buddy. As you can see the list is fairly all-encompassing. For those you without any knowledge of Latin, many of these sections may sound totally unfamiliar. Some of the terms and practice levels are very specific and require professional med school-level knowledge. Nevertheless, just about anyone can learn something new with this app. Without any real medical background, you guaranteed to get stumped on the difficult levels. I had a lot of fun playing around with Speed Anatomy. As a non-medical person, I quickly got disinterested in the app at the higher practice levels. After a certain point, I started feeling completely lost and disoriented. One of the things I found missing from this app was a complete list of all the most important medical terms. 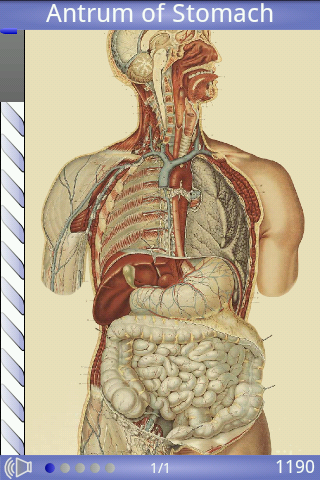 For all your medical students, doctors and nurses out there – this app is definitely a treat! Obviously, I can’t really evaluate how useful this app really is in preparing for an anatomy exam, but I am sure it wouldn’t hurt. The buttons on the main screen aren’t very well designed. You need tiny baby fingers to be able to select the right button. The graphics are made up of anatomical pictures as seen in regular high school biology books. Once you’ve selected an organ or run out of time, the right answer is displayed in color. This way you can easily tell if you’ve clicked on the right body part. The developer must have taken a lot of time to color in all of the individual organs. Taking this into consideration makes me really appreciate this app! Speed Anatomy allows room for small inaccuracies while playing. The app rewards precision, but still gives you a couple of points if you made a very close guess. The magnifying glass tool allows for greater precision in clicking the right organ, vein or bone. The magnifying glass appears automatically if long press the screen. The free version includes integrated ads. Thankfully, these are only displayed on the main menu and not in the actual levels. What a relief! Speed Anatomy is both fast and reliable. No problems experienced. 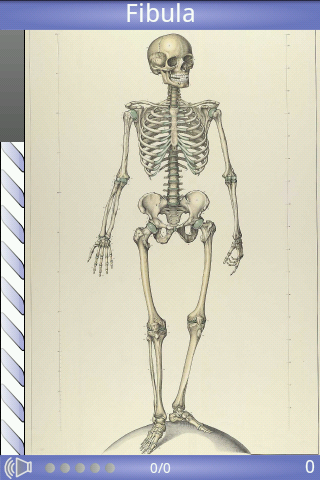 Speed Anatomy can be downloaded for free from the Market and App Center. You can download an add-free version for 1 CAD.